[Updates below] A schematic design proposal for a new Fine Arts Library at Cornell has been submitted by AAP alumnus Wolfgang Tschapeller. 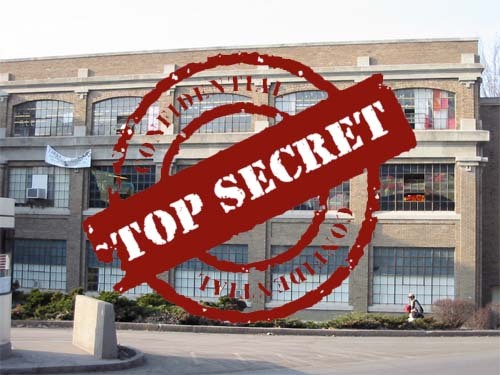 For some reason, the 100% schematic design submission is being treated as a top-secret document, and can only be seen by venturing into the Dean’s office in Cornell’s College of Architecture, Art, and Planning. There are several additional problems with this scheme. Another elevator and shop disruption. Even after finally installing an ADA-compliant elevator in Rand Hall as part of the Milstein Hall addition, this new renovation of Rand Hall — by creating “floating” stack areas disconnected from the original Rand Hall floor plates — actually requires a new, second, elevator to access the stacks. Such an elevator, aside from the extravagance of having two expensive elevators in a 3-story building, will require that the 2nd-floor slab be removed under the elevator — even so-called pitless elevators require some space under the elevator cab so that the cab floor surface lines up with the floor slab adjacent to it. This, along with all the other required work in the first floor of Rand (including a new mechanical room, structural modifications along the building perimeter, and the creation of new fire-rated doors and openings), will disrupt the operation of the Rand Hall shop, a College facility that has become extremely important to our teaching mission. Wall insulation. By placing insulation on the inside of the existing masonry walls, the brick and concrete exterior materials will now be colder in the winter, and will not be able to dry out to the interior spaces. This makes them more susceptible to deterioration, mold growth, and other potential problems. Joseph Lstiburek has written about these issues in an article called Interior Insulation Retrofits of Load-Bearing Masonry Walls In Cold Climates. Putting insulation on the inside of a multistory building also guarantees that there will be thermal bridges at the intersecting floor levels, since the concrete- and steel-framed floor slabs interrupt the wall insulation and provide conduits for heat loss or heat gain (depending on the season). If a masonry building is to be insulated retroactively, it is far better to place the insulation on the outside. Not only are thermal bridges avoided, but — equally important — the thermal mass of the 12-inch-thick brick walls is taken advantage of to stabilize interior temperatures while increasing comfort in the space. All that thermal mass is wasted when it is separated from the interior spaces by a layer of insulation placed on the inside surface of the brick. The architects explain that they wish to preserve the historic character of the building by intervening on the interior rather than the exterior surfaces. Two points should be mentioned regarding this decision. First, Rand Hall is not a particularly distinguished example of early twentieth-century brick-clad industrial/academic building, and was never placed on any official list of historically significant buildings. It was deliberately excluded from the “local historic district” designation that applies to the rest of the nineteenth-century Arts Quad buildings at Cornell; in fact, the University planned to demolish it entirely when they first created a program for Milstein Hall. That it was “saved” has more to do with a vision of sustainability that values the preservation of existing floor area, rather than a notion that the building itself was of historical significance. Of course, this viewpoint can be challenged, and others may assess the historical significance of Rand Hall differently. But even if its value as a historical artifact is assumed, the architectural design contradicts this very assumption, and brings up the second point: not only are Rand Hall’s historically-specific industrial sash windows being removed and replaced with generic large glass panes, but a rather aggressive “hat” is being placed on the top of the building that radically transforms its character. To put this another way, such a hat would never be permitted on a historically-designated building such as, for example, Sibley Hall. That it is meant to be deployed on Rand Hall obviates any claim to the historical importance of that building, and betrays a cynical opportunism with regard to historical preservation in general. Cost. This project is so expensive that approximately $4 million still needs to be raised, in spite of the generous gift of $6 million from Mui Ho and several million dollars more promised by Cornell (under the guise of deferred maintenance, or some such thing). It is incredible that all this money and effort is being set aside for a project that is likely to become obsolete in a short period of time, if it isn’t already. I am not raising the issue of cost out of some misguided belief that architecture can be created without spending money — i.e., without spending more money than would otherwise be required for a bare-bones building. That being said, any client must weigh the money being spent on gratuitous architectural embellishment against the ephemeral benefits (if any) gained by such an expenditure as well as the opportunity costs foregone. The proposed scheme would undoubtedly be thrilling to behold, and creating and experiencing such thrills is certainly a part of the human project. Yet that hardly means that every building needs to embody such heroic posturing. Even if one wanted to keep a library with physical books, the current “temporary” library on the third floor of Rand serves this purpose admirably. It is true that many of the collection’s books are housed off-site in an annex, but this is hardly an inconvenience. As a library user, I can attest to the ease of finding books in Cornell’s online catalog and placing “orders” for them (actually from any library on campus in addition to the library annex) that are then delivered directly to the Rand Hall circulation desk within a day or two if they aren’t already available in digital form. Because the books and periodicals that are used most often have been placed in Rand Hall and are not in the annex, any inconvenience is minimized. The idea of making a fetish of these physical objects by recreating some sort of nineteenth-century library stack condition when it is clear that books will increasingly be digitized — a tendency that has the potential of making the knowledge embedded in books accessible to all rather than restricted to an elite — this idea can only be characterized as reactionary and counterproductive. 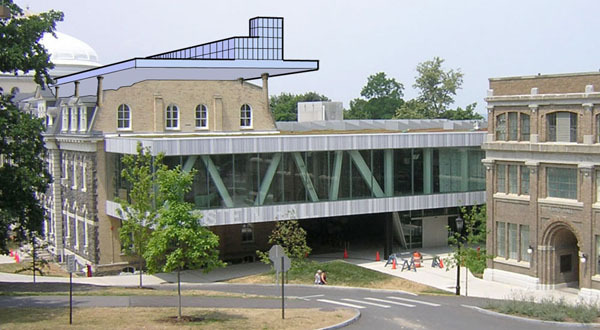 The petitioner describes the construction of Milstein Hall as having been “downgraded” by virtue of its connection to Sibley Hall and states that providing “a fire barrier” [the petitioner must mean “fire wall” here, since a “fire barrier” was provided] separating Sibley from Milstein Hall was rejected “because of concerns for the historic character of East Sibley.” First, to argue that fire walls were not provided out of concern for issues of historic preservation is disingenuous, irrelevant, and untrue. Fire walls were not provided because the architects for Cornell University, supported by City of Ithaca Code Officials, made the determination that fire walls were not required under Appendix K of the 2002 BCNYS. Second, the implication that only a fire wall would have allowed Milstein and Rand Halls to be freed from the constraints imposed by Sibley Hall’s Type VB construction is simply untrue. Sibley Hall’s construction type can be changed at any time to Type IIIB by simply upgrading the sloping third-story exterior wood bearing walls so that they have a 2-hour rating (even using fire-retardant-treated wood framing per Section 602.3 of the 2010 BCNYS). While this would be inconvenient, it is hardly impossible – especially since the entire third floor of East Sibley Hall is currently vacant and slated for a substantial renovation. This is true even if the entire building is defined as nonseparated construction governed by the Group A-3 library occupancy, as proposed in the architect’s schematic design report. Section 508.3.2.1 of the 2010 Code (Occupancy classification) states that: “Nonseparated occupancies shall be individually classified in accordance with Section 302.1. Code requirements shall apply to each portion of the building based on the occupancy classification of that space except that the most restrictive applicable provisions of Section 403 [not applicable here] and Chapter 9 [fire sprinklers] shall apply to the entire building or portion thereof.” All that the nonseparated status accomplishes is to make it unnecessary to have a fire separation between the first floor and the library above and all that it constrains are allowable areas and heights “based on the most restrictive allowances for the occupancy groups under consideration for the type of construction of the building…” The nonseparated status therefore does not eliminate the need to consider each occupancy type separately when considering the required fire-resistance rating of a fire wall. Rand Hall therefore cannot be considered as a separate building with its own construction type, unless a 3-hour fire wall is constructed. This interpretation has been confirmed by James D. Connell, P.E., Team Leader, A & E Services, International Code Council, Inc. in an email sent to me dated April 20, 2015. The International Code Council (ICC) develops model codes and standards, including the International Building Code which serves as the basis for the 2010 Building Code of New York State. While their Code interpretation has no official standing in this context, it provides additional evidence that the logic underlying the architect’s Code analysis for the fire wall separating Rand from Milstein-Sibley Halls is flawed. The ICC opinion states: “A three hour fire-resistance-rated fire wall is required and,” in answer to my follow up question (“does Table 706.4 note ‘a’ permit a 2-hour wall, even with the F-1 occupancy…”) states unequivocally, “No. Note ‘a’ in Table 706.4 does not apply to fire walls separating Group F-1 occupancies from other occupancies. The vertical continuity of fire walls in Section 706.6 will require the 3 hour fire wall to extend full height.” It makes no difference whether or not the A-3 and F-1 occupancies are considered nonseparated uses. This interpretation has been confirmed by Jason C. Toves, Technical Staff, Architectural & Engineering Services, Technical Services, International Code Council, Inc. in an email sent to me dated April 20, 2015 and in a phone conversation on the same day. It should also be noted that this Code interpretation also applies to the mezzanine (entry bridge) level in Milstein Hall [see 4/22/15 update below], and renders the entire design concept for Milstein Hall — with its three interconnected floors — noncompliant. I had written about Milstein’s “Questionable mezzanine designation” in 2012. [4/22/15 update] Actually, Milstein Hall’s mezzanine, although still “questionable,” isn’t overtly noncompliant because the 2002 Building Code of NYS, under which it was permitted, has a subtly different take on the story-floor distinction. The language in Section 505.1 of the 2002 Code is different from the language in later versions and states: “A mezzanine or mezzanines in compliance with this section shall be considered a portion of the floor below.” That appears to suggest that the Milstein mezzanine does not count as a separate floor which means in turn that only two floors are interconnected. Later versions of the Code have corrected this error by replacing the word “floor” with the word “story,” making it clear that the Rand Hall mezzanines (based on the 2010 Code) would be noncompliant, since they do count as separate floors. It should be noted that Milstein Hall is now nonconforming, and future changes may not be possible unless its mezzanine condition is somehow fixed. [4/29/15 update] Here’s the image that Cornell uploaded to their twitter account, showing the four stack (floor) levels, all interconnected in violation of the 2010 Building Code of NYS. [4/30/15 Update] The 2010 Building Code of NYS provides various ways to safely create openings between floors, enumerated in various exceptions to Section 707.2, which otherwise requires a shaft enclosure for all floor openings. The current schematic library design attempts to use exception 7, which permits openings between two stories, but also requires that those openings be separated from floor openings “serving other floors.” It is this latter requirement, listed as exception 7.6, that is not met in the current scheme. There is, however, a way to preserve most of this scheme’s formal characteristics — not that doing so is a good idea, since this scheme, even aside from its fire safety issues, has many other problems described above — by utilizing one of the other exceptions in Section 707.2: specifically, exception 5 for atriums. Once the opening in this space is evaluated and defined as an atrium on the basis of exception 5, it is no longer necessary to meet the requirements of exception 7 (which restricts interconnections among “floors”), and only the requirements for atriums, listed in Section 404 of the Code, need be satisfied. It turns out that such requirements are rather minimal because the proposed atrium opening only connects two stories. This is true because the mezzanine requirements in Chapter 5 are actually met and the mezzanine floors therefore do not count as stories. Two-story atriums need not satisfy the smoke control requirements of Section 909 that otherwise would require much additional modifications to the scheme. Adjacent spaces (i.e., book stack floors) that would normally need to be isolated from the atrium opening by one-hour fire barriers are not required for any three floors (Section 404.5 exception), so that only one of the four stack levels would need some kind of separation from the open space. That’s it: exit access travel distance is limited to 200 feet in atriums (rather than 250 feet for normal sprinklered assembly occupancies), but other than that, no other fire-rated separation is required, and no smoke control systems are needed. The proposed 2-hour fire-resistance-rated fire wall is still noncompliant, and would still need to be upgraded to a 3-hour wall, as described above. This entry was posted in Architecture, Milstein-Rand-Sibley Hall on April 21, 2015 by jonochshorn. My name is Jeff Stein and I’m the editor of IthacaVoice.com — I’d love to republish this as an opinion column, assuming you’d be interested. I can be reached at jstein@ithacavoice.com or 917-887-2891 if you’re interested. 1. 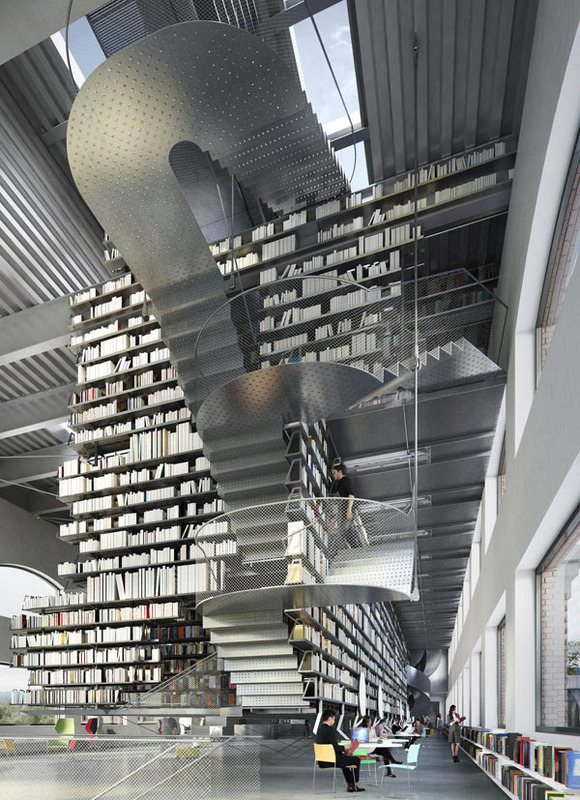 I use the library, but I am afraid of heights, including open stairways. With this design I’ll end up ordering my books at Olin and having them sent over from the Fine Arts Library.